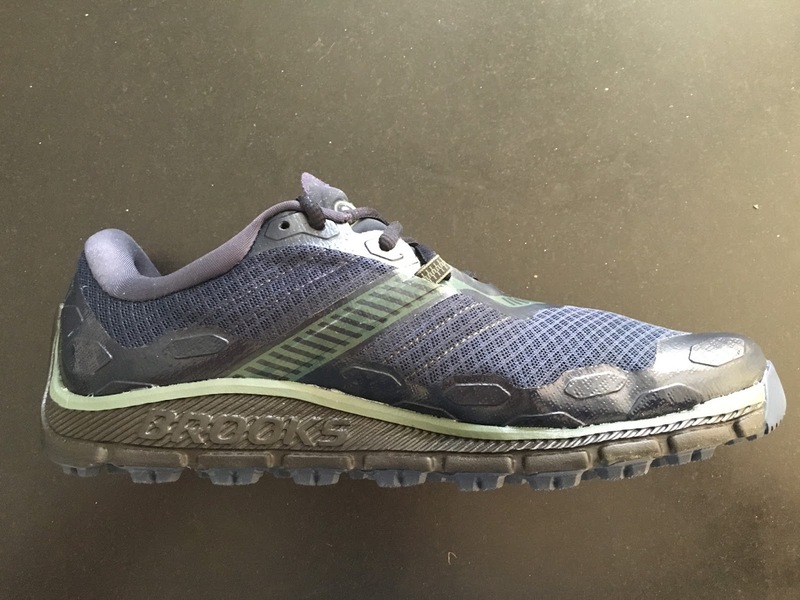 The Brooks Running PureGrit 5 is a 9.9 oz/281 g men's 9 trail runner with a 21 mm heel/ 17 forefoot, 5mm drop. 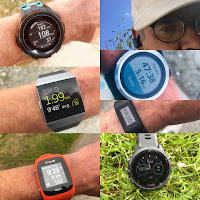 It sees significant upper changes from its prior editions, the most significant of which is that the Nav Band is gone. It is low slung yet highly protective with a well reinforced upper, forefoot Ballistic Rock Shield and dense 3D hex lug coverage. I took them for a first 5 mile trail run on a combination of smooth and fairly rooty and rocky single track, even a mile or so of road. My last Pure Grit was the original. I was particularly struck by the flexibility and smoothness of the forefoot mid and out sole ride. The combination of rock shield, Omega flex grooves in the midsole and firm continuous rubber and lugs under a relatively soft midsole makes for a very smooth, agile yet surprisingly cushioned front ride, especially given the relatively low17mm forefoot stack. Those familiar with prior Pure Grit will see that the "infamous" Nav Band strap is gone. It is replaced by a flat webbing tied into the laces.The webbing is embedded in a thick overlay running to the midsole. Just behind the stabilizing band, the tongue is drawn close to foot by its own webbing loops. The effect is of the stabilizing band being wrapped over the tongue and the tongue below wrapped over the foot. The foot hold is outstanding yet non constricting. The rest of the upper is different from the last PureGrit as well with a rand of shiny blue rubber seamless overlay extending from the midsole up the upper about an inch all the way around. This helps protect the shoe, keeps water out, and stabilizes the foot to the platform. During my first run I found the new rubber layer effective with no issues beyond a sensation of the rubber's firmness over the front of the toes, but only when standing. On the run that sensation disappeared. I fit true to size. Pure Grit is a snug trail shoe fit but a comfortable one with no tight areas or discontinuities in fit when laced snuggly. The mesh is soft and pliable. The foot has plenty of room to flex during stride. Back of the lace up is where I notice some things not as much to my liking. The heel collar is low and quite lightly supported between the laces and the firm heel counter. PureGrit 5 has a firm and stable landing, a bit to firm for me, followed by a bit of instability at times from the heel collar just behind the laces. This is compounded, at least for me as a heel striker, by the curved Ideal Heel geometry. I like my heel landing areas to be flatter to the ground or extend a bit behind the heel counter. The Pure line with its the Ideal Heel a common feature of the PureFlow, PureGrit and Pure Cadence is designed to encourage mid and fore foot striking. When I am on the mid foot it feels great but when back on the heels and add in that low soft heel collar I wasn't as secure in my footing as I like. Nothing major but to note. Update: Took the PureGrit 5 for a 14 mile fairly rugged trail run above Park City, 2400 vertical feet at altitude. Trails were smooth single track with embedded smaller rocks. As above front of the shoe protection and climbing agility was outstanding. Rear of the shoe could use more support, stability and heel width for heel strikers. Many more miles to come before a full review. 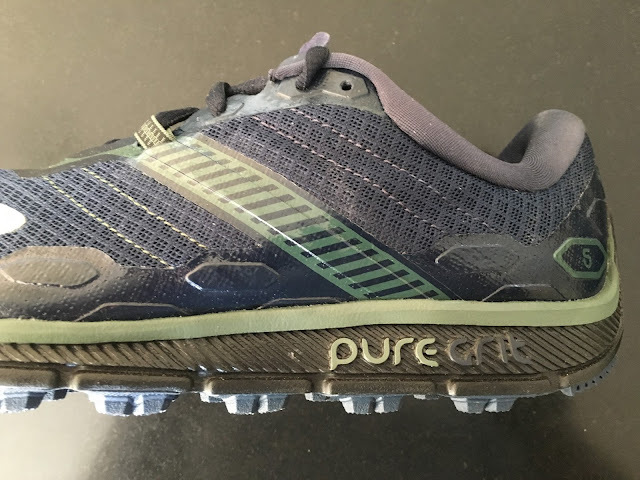 I will certainly be making the PureGrit one of my shoes for medium length and difficulty trail runs this summer due to its very nice combination of protection, cushioning, and agility all in a less than 10 oz package. It is a great choice for all types of trails and especially for runners with a mid foot landing. Brooks Running sent us the PureGrit at no charge. The opinions herein are entirely our own. Sam is the Founder and Editor of Road Trail Run. He got the run and gear bug early, testing some of the earliest Nike shoes in the 70's, in high school, when Nike had their original R&D in his hometown. 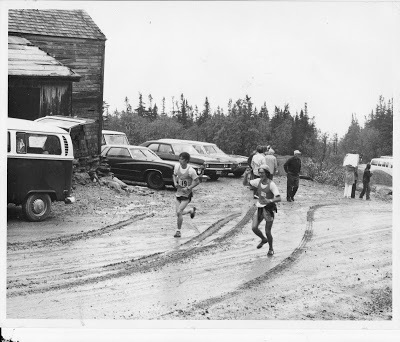 Early 100 mile weeks and lots of trail running led him to a HS 2:37 marathon, (2:28 PR), 2 junior division victories and 2 top ten all time junior times at Mt Washington, and the 1976 Division 1 NCAA XC championships with his Dartmouth team mates. Fluency in French took him for work to Switzerland where he ran many classic mountain races (30 in one year including ski marathons) and met his wife Dominique, also a marathoner. Raising a family and with entrepreneurial and consulting ventures in materials science, in-store media, early internet social media, and electronic medical records his competitive running took a long hiatus. He got back at it 10 years ago when work took him to the mountains of Park City, UT. His annual goal is to break 1:40 in the half, and if he can...,qualify for Boston. 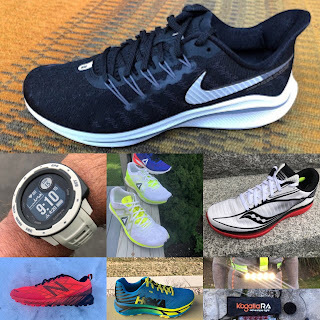 Always a tech, shoe, and gear geek he is also the wearable tech columnist for Competitor Magazine.